In 2014, Iraq was said to lose 42% of its territory to Daesh (the Arabic acronym for what our press calls ISIS or ISIL). This statistic refers to the loss of the mostly Sunni Arab provinces of al-Anbar and Ninewah, as well as parts of Salahuddin and Diyala. It is a little bit misleading, since al-Anbar is very big and very thinly populated. I figure Daesh now rules over on the order of 2.6 million Sunni Arabs in Iraq, not the full 5.6 million who probably make up the third-largest community after the Shiites (60%) and Kurds (22%)* [see bottom of post for my reasoning here]. But not only has Baghdad lost nearly half the country’s territory and about half the country’s Sunni Arabs, it long ago lost the 7 million Kurds, who have now taken over Kirkuk Province from Arab Iraq. (Kurds say they just inherited Kirkuk when the Iraqi army ran away from it before the Daesh advance that only Kurdish forces and US aerial bombardments halted). Kurds speak an Indo-European language related to Persian and English, not Arabic, and so are not “Arabs.” Moreover, the Kurds just last week took parts of Ninewah Province near Syria away from Daesh so as to rescue the Yezidi Kurds in Mt. Sinjar, so that Kurdistan has greatly increased in territory de facto in the past six months. The first reaction of Kurdistan president Massoud Barzani to the Daesh take-over of Arab Iraq was to promise a referendum on independence within 6 months. Barzani backed off that kind of talk under pressure from President Obama, who presumably acted at the behest of Iraq’s regional neighbors, who fear an expansionist Kurdish state. But while Barzani may not declare independence any time soon, he already has it in all but name. There are no Iraqi troops on Kurdistan soil, and Kurdish children don’t learn Arabic in school or identify with Iraq. Quebec is much more firmly integrated into Canada than is Kurdistan into Iraq. 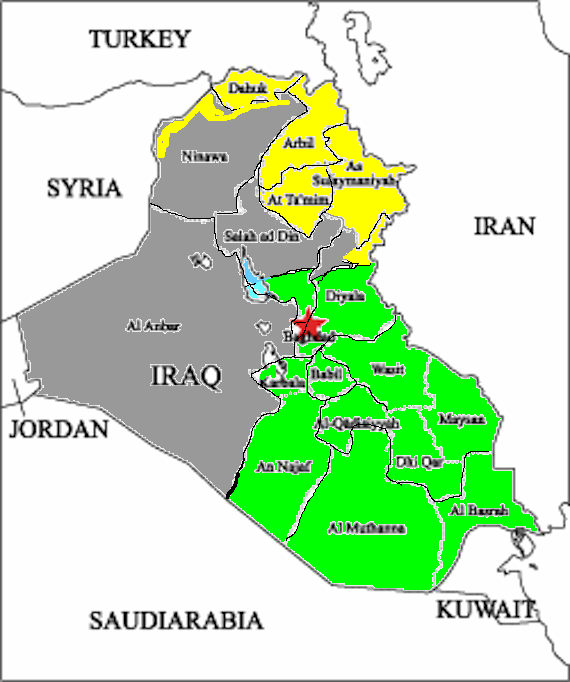 (In this map, the Kurdish territory is yellow, regardless of in which province it is held; dark gray is Daesh; and Shiite-held territory is green, including in southern Salahuddin and Diyala provinces, which have big Sunni populations. The map is more suggestive and notional than precise. ). In short, as I write, Iraq is a polite fiction, not a country. Could Iraq be put back together? The sad answer is that likely the Sunni Arabs will be brought back under Baghdad’s sway, but Kurdistan is gone except on paper (and likely has permanently detached new territory from Baghdad). The Sunni Arabs of Iraq acted desperately when they allied with Daesh against the government of then Prime Minister Nouri al-Maliki last June. The Sunni Arabs felt oppressed by the Shiite-majority government and deprived of basic services. In many instances they were actively in rebellion against the government and were being shelled or even aerially bombed. But it was a mad, tragic mistake. They allied themselves with a force notorious for its genocidal brutality, which is unacceptable to all the regional neighbors, despite the support it may receive from very wealthy Gulf businessmen who should have their heads examined. The ruling Da’wa (Islamic Call Party) in Baghdad won’t accept Daesh’s rule over Sunni Arab Iraq. While its army collapsed, it still has nearly 20 million Shiite Iraqis to draw on militarily (probably 3 million able-bodied men, i.e. almost as much as the entire population of Daesh-ruled territory in Iraq). The Kurds won’t accept it, and they also have designs on Mosul the city (formerly 2 million, now probably only a million) that Daesh took as its Iraqi base. Iran does not want it there. Iran has a population of 75 million and has already bombed Daesh and also has sent some Revolutionary Guards for actions like the campaign to save the Turkmen Shiites of Amerli. Russia does not want it there, since its ranks contain radical Chechens and it is a 24 hour drive from Russian territory. Russia has already given weaponry to the Baghdad government. The United States, France, the UK and even Australia do not want it there. My guess is that the major Daesh commanders will mostly be dead in only a few years. I fear that what the Bashar al-Assad regime did to Homs, reducing it to rubble to defeat Sunni Arab rebels, including Daesh and al-Qaeda, there– that a similar action will be taken against Mosul in 2015. So it is in fact likely that Arab Iraq will be violently reunited, and that Sunni Arabs will be forced, sullen as they might be, to acquiesce. Whether Baghdad could keep them in the aftermath would depend on political facts. How much did they come to hate Daesh in the meantime, and will they be relieved to be rescued, even by the Shiite Da’wa Party, their rural cousins, and the US Air Force? And, have the Shiite parties in the South finally learned their lesson about sectarianism and are they willing to offer the Sunni Arabs a fair shake? Can the new Prime Minister, Haidar al-Abadi, buck the sectarian impulses in his Shiite religious party, the Da’wa (the same one to which al-Maliki belongs)? Above all, Iraq needs a secular Labor Party that can unite working people across ethnicity. “Islamic Call,” the Sadr II Bloc, the Islamic Supreme Council of Iraq, the Virtue (Fadila) Party, along with the Iraqi Islamic Party– these have all failed, manifestly failed. They offer nothing to the Sunnis. If Sunni Arab Iraq does ultimately detach, in order to do so successfully it would need a regional patron or more than one, and would need to be seen as non-threatening by its neighbors, which means it can’t be satanic the way Daesh is. Iraq may limp on, maintaining the fiction that Kurdistan is part of it. But whether it permanently loses the Sunni Arabs depends on military and political skills that Baghdad may or may not have. *Iraq’s Sunni Arabs are likely only 17% or so of the population of 33 million, i.e. about 5.6 million people, about as populous as Finland or Singapore. About 1 million of them live in Baghdad (a city of 7 mn which I figure is now only about 15% Sunni), which is still under central government control. That leaves 4.6 mn in al-Anbar, Salahuddin, Ninewah and Diyala. But since some 2 million Sunni Arabs and others living in those provinces have been displaced in the past year, actually those remaining under Daesh rule likely only amount to about about 2.6 million. (I doubt Daesh rules more than 1 million in Syria, mainly in al-Raqqah Province, so Daesh probably has kidnapped about 3.6 mn. Sunni Arabs for its laughable ‘caliphate’, not the 8 million often touted by the pundits).